On April 11, 2019, our founder Du Yufeng and some of our volunteers found 235 dogs in an illegal hoarding site at a livestock market in Pujia town, Dazhou City. 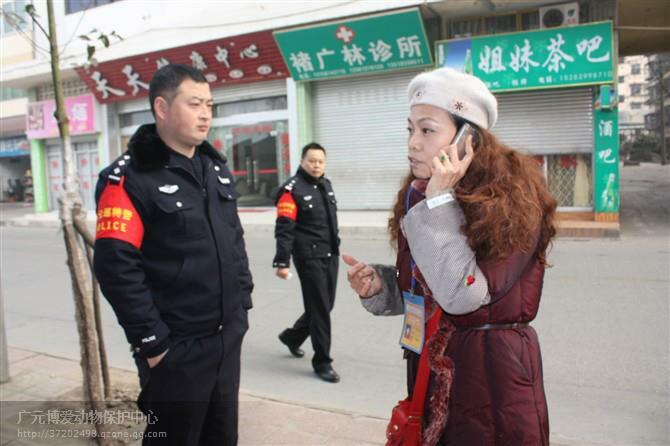 They immediately called the police and government officials who came to the scene to assess the situation. 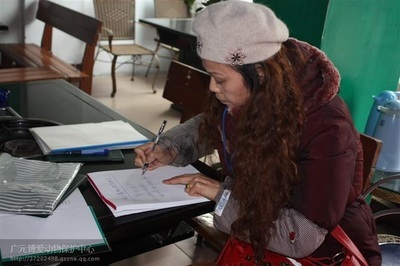 On the afternoon of April 12, the Agriculture and Forestry Law Enforcement Department and the Public Security Bureau invited Du to discuss the handling of the case. 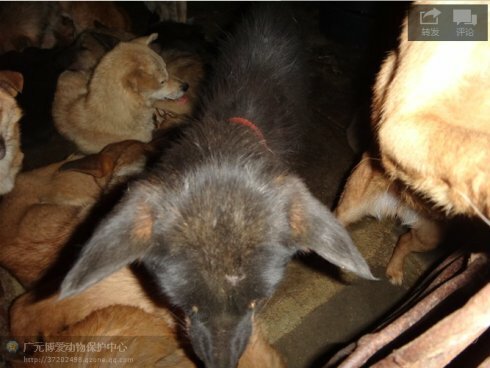 It was agreed that the dogs would be placed in our care after 21 days of isolation. Activists from Dazhou City joined our team and for 4 days and nights in the cold and wet Spring weather they have all watched over the dogs. The dogs were moved to a better safe place where they could stretch their legs but there are some sick dogs and we all know that diseases can run rife in these situations. 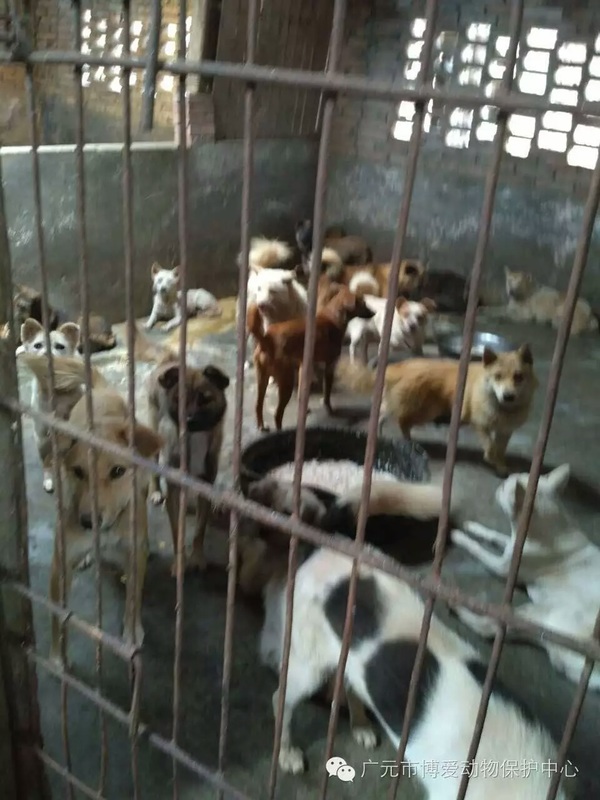 We cannot move the dogs anywhere else until the 21 days isolation period is up so we desperately need your help to buy medicines and vaccinations. 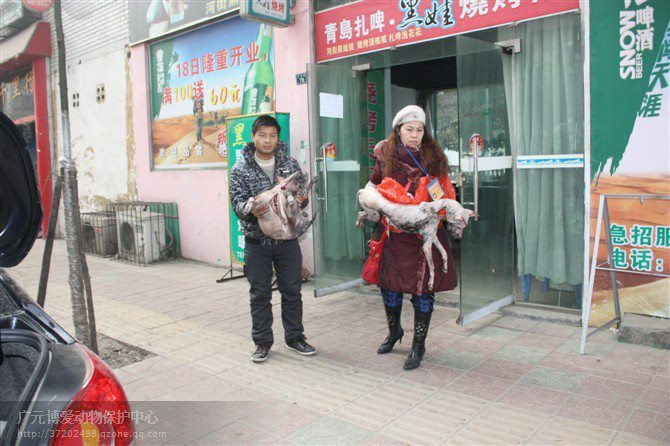 At this time of year, Sichuan is a hub of trafficked dogs and cats on their way to Yulin for the sickening festival there next month. 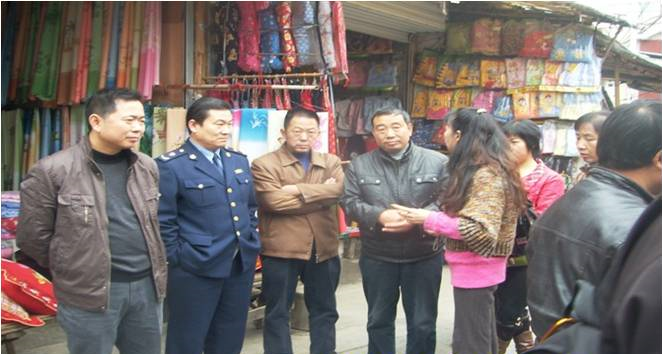 Please help us to help them. Donate easily via paypal by clicking on the button. Thank you so much! 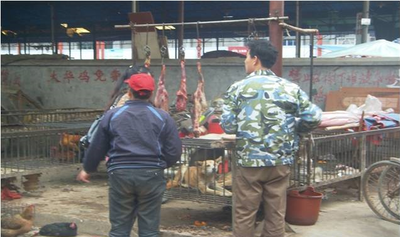 Dog slaughtering happens often and many times we do not even know about it until we receive a tip off of when we are in the area. 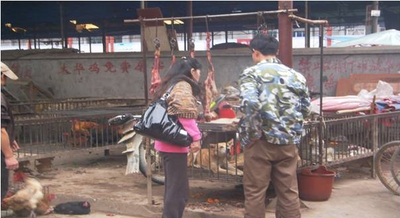 On this occasion we confronted a stall in a market hall where dead dogs were for sale. 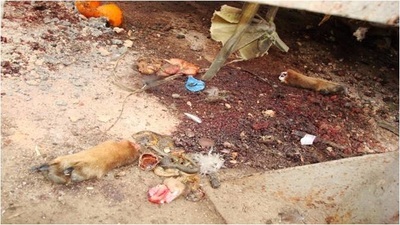 Their carcasses were bought and taken back with us. ​On the same day, with the help of officials, we visited a restaurant that was serving dog meat and when we arrived at the scene, there were freshly slaughtered dogs in the kitchen. Again, the dogs and carcasses were confiscated and taken with us. 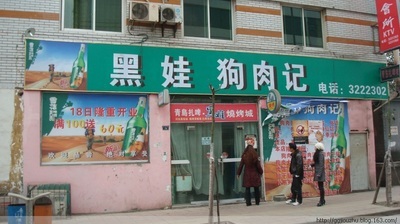 The restaurant owners refused to tell us who supplied the dogs but the restaurant was closed down anyway. 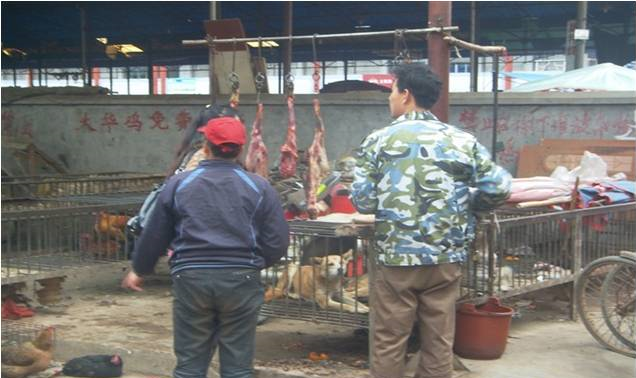 Cherish life, Protect animals, Say NO to cat and dog meat eating! Everyone has heard of Yulin's 'Dog Meat Festival' but no one has heard of the dog meat trade in Sichuan Province, OUR province. 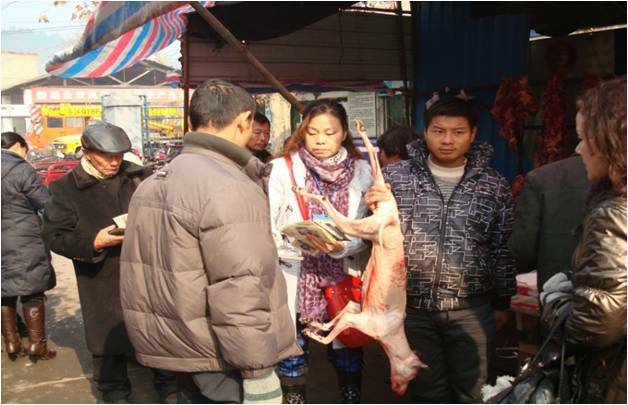 Jianyang, Sichuan is one of the largest dog meat trade centres in China. 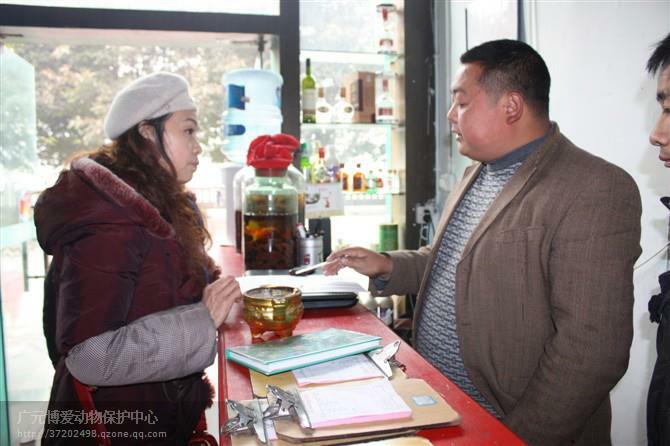 Illegal quarantine certificates are purchased, enabling the truck drivers to 'legally' make the journey to Guizhou, Guangxi and Guangdong Provinces with sometimes thousands of dogs (and cats) on board. We have tried unsuccessfully numerous times to stop this but with corruption everywhere it is hard. The annual average is several hundred thousand dogs and cats of unknown origin. 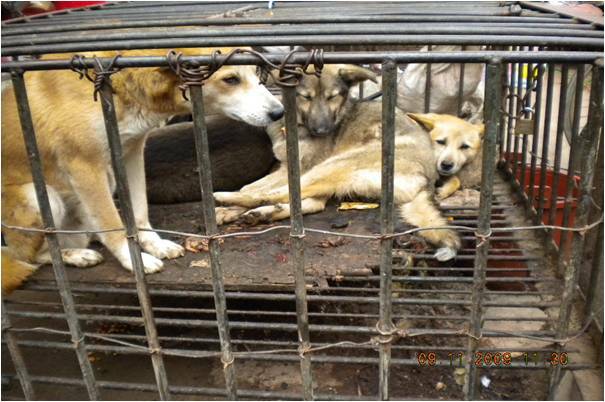 In January 2013, we intercepted a truck full of dogs destined for Jianyang. 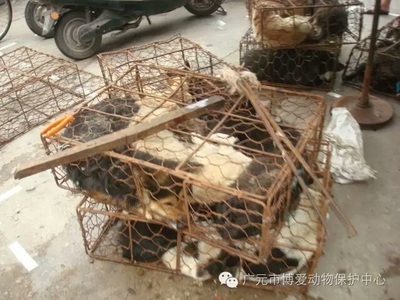 These dogs were crushed in to small, overcrowded iron cages. The local newspapers and news media have repeatedly reported and exposed the dog meat trade in Jianyang, the stealing and trafficking of dogs and cats but nothing has changed. This black death industry is seriously damaging our country's image. We can no longer be silent! We have to stand up and be heard! 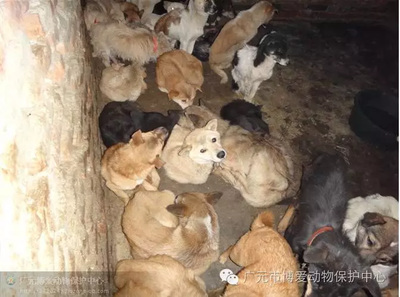 We are calling on the netizens of the country to help us stop this because it can be said that to take away Jianyang trafficking it could save thousands of dog and cat lives every year. You can help us too. 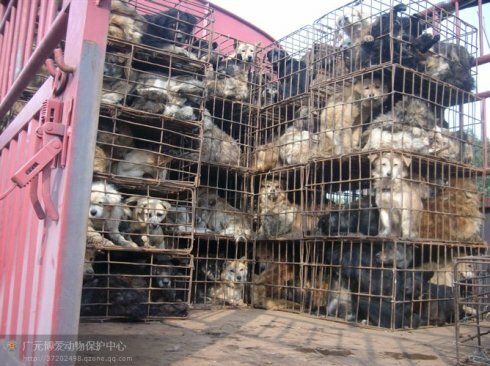 Keep calling or emailing your Chinese embassy to urge the government to ban the dog and cat meat trade, organise and attend protests, and share our posts and videos to educate and inform people of the brutal torture that companion animals endure in China's dog and cat meat trade, every day, week, month and year. 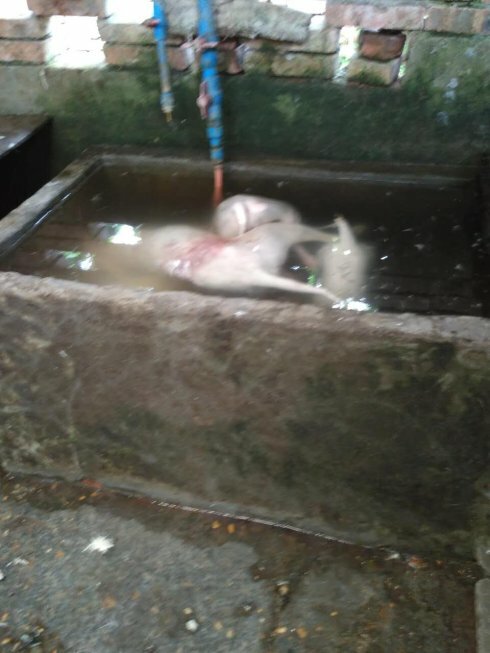 We were able to ask for the government's help to close down this butcher's stall and seize the 4 live dogs left there, waiting to be killed. 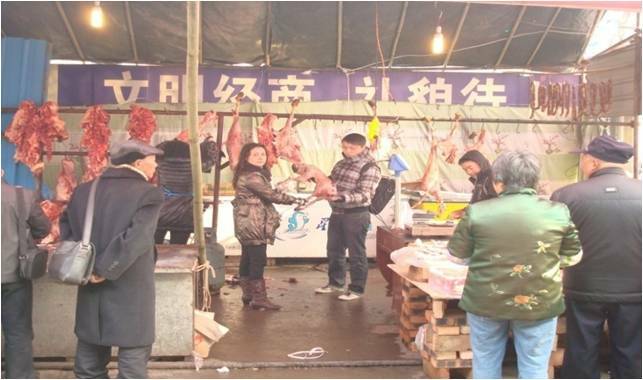 Our founder, Du Yufeng, had previously visited the stall and asked the butcher to show her paperwork and he refused so she arranged to meet with the government officials and take them to the stall where she briefed them. When the officials seized the dogs and handed them over to Du, the butcher complained that she was taking away his livlihood and that there were lots of stalls like this one. Du replied that she would shut them all down. 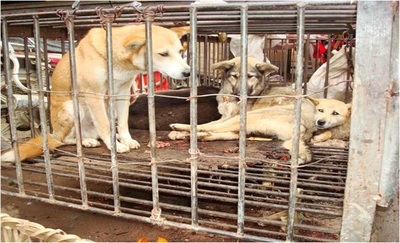 The dogs had never been given any water to drink and when Du took them out of the cage where they were being kept, 2 of the dogs were so frightened (the black dog & the last dog to be removed from the cage) that they urinated on Du with one of the other dogs drinking the urine because it was so thirsty. 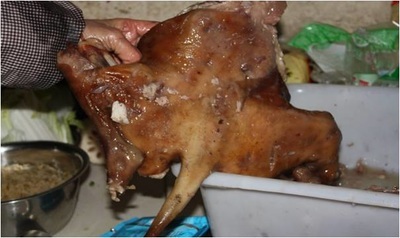 The last dog out of the cage had a broken hind leg and you can see one of our volunteers (in the video below) pointing in the cage where it was led on intestines. 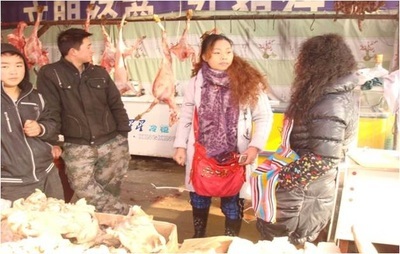 The dog seller probably threw the innards of one of the dogs who had been slaughtered in to the cage for the dogs to eat while they waited their turn to be slaughtered. Feeding the dead remains of probably diseased dogs to others is a recipe for disaster and this is one of the ways we educate dog meat eaters. By telling them that they are eating diseased meat. ​In the first photo below, the dog on the left, Da Huang, is available for adoption. Click on the photo if you are interested in adopting this lovely girl. 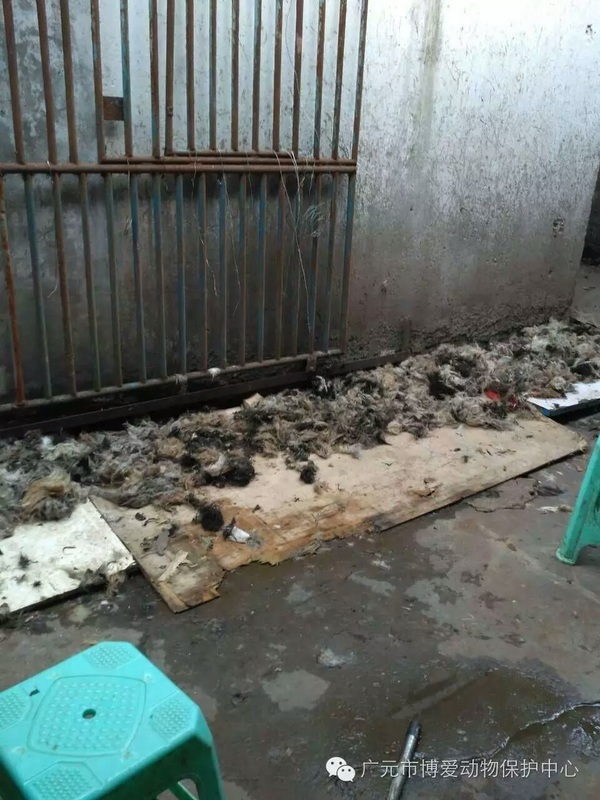 Our founder Du and local animal activists, helped by the local police, closed down a dog slaughterhouse and rescued 36 dogs in Kong Que Village, Chengdu. The animals were sent to a sanctuary called Rong Cheng in Chengdu co-founded by Du and local activists. Other furry residents have since arrived. 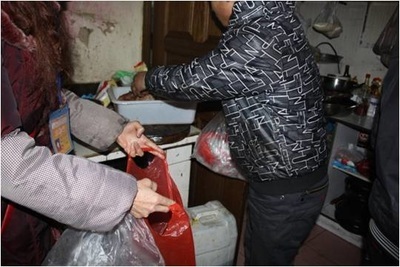 When we visited Lijiang to hold our anti fur education event, we also took the opportunity to help some of our friends, Buddhist monks, to close down a slaughterhouse and rescue dogs. Evidence was gathered of the slaughterhouse’s illegal activity and to make sure the slaughterhouse was closed down for good we enlisted the help of the local police. 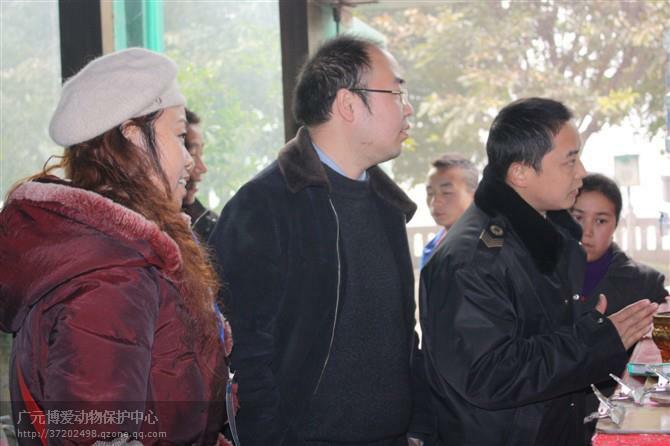 As the dogs were released in to the care of the monks, our founder Du Yufeng took them to the land at the back of the slaughterhouse and gave the food and water. 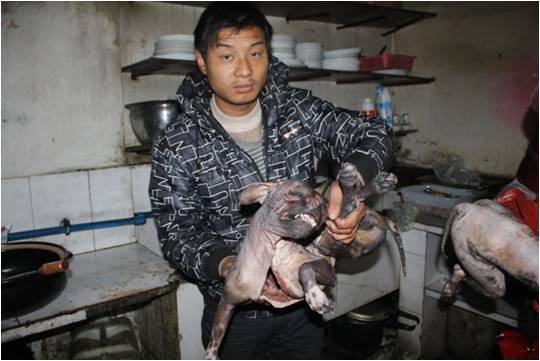 The dogs were handed over to us along with skins and carcasses. 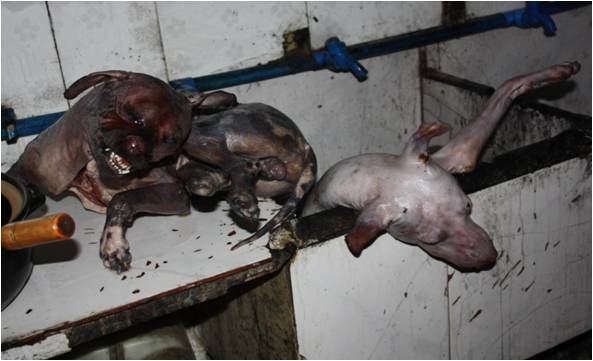 The police told the slaughterhouse owner to take the skins and carcasses to our vehicle where the monks were waiting with the dogs. These terrified dogs were saved from unimaginable torture. They were taken back to the monks’ shelter to start a new life, safe and happy, with the other rescued animals.